Slate Grey Range Cookers - The More the Merrier! When it comes to range cookers the choice of colour is a very subjective thing, and like many style-choices, tends to come a go with the times. At one time dark blue was all the rage, then green was the thing, followed by pastel shades. The traditional staples of cream, black or stainless steel are always there, of course, but these more transient colour-trends reflect the times. These days kitchens are all about surface finishes and the colour palette is fairly monochromatic - the perfect backdrop for a stunning focal point in slate and charcoal grey. A dark grey range cooker, often in a matt finish, works stunningly well and is a bold yet neutral style statement which allows any accent colours, whether on floor tiles, small appliances or tea towels, to do all the work and add nuances to the room without over-powering. Less prone to fashion than true colour, this is a finish that should age very well too, and look just as cool in ten years as it does now. , are also making Slate available on their very attractive and superb value Vintage 90DF Twin. model ONLY, but will hopefully appear on more models in due course. 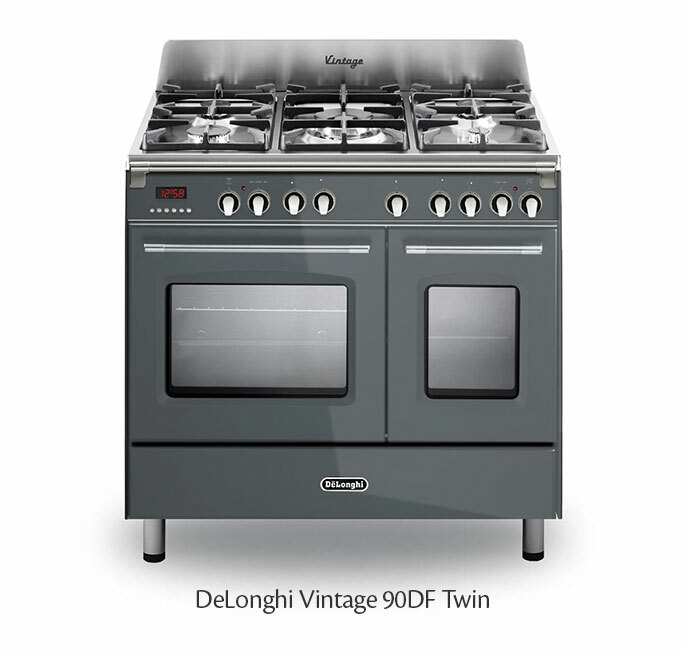 * the Vintage 90 gives you a large multifunction main oven with a second, conventional oven on the right, both with grill. 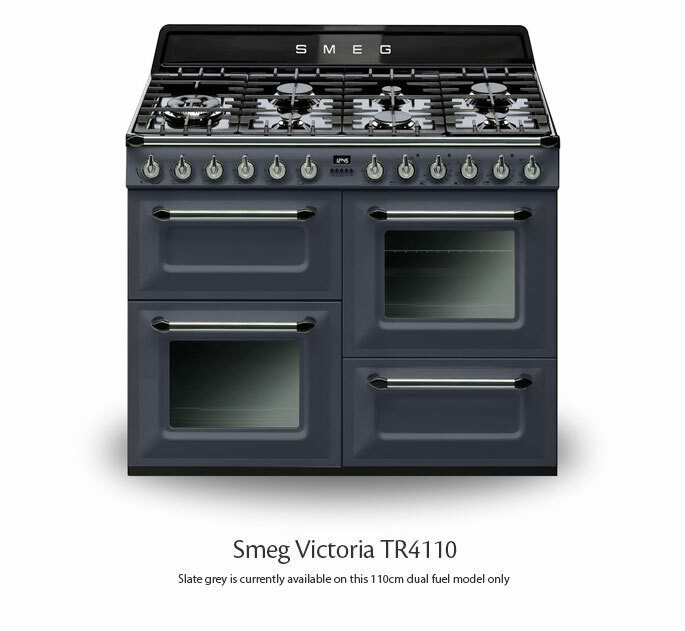 Similarly to the Smeg but perhaps more subtle, this cooker has an appealingly retro look, with gentle bevels on the doors and nicely designed metalised plastic control knobs, complemented by soft-edged handles, towel rail and a rounded front edge on the hob. Available in dual fuel only, this is a great package at an amazingly good price. In adding Slate (a gloss finish) to their established colours of black, white and stainless steel DeLonghi have spotted and opportunity to bring a finish hitherto only found on more premium ranges to customers with similar taste but smaller budgets. We think slate grey is the perfect choice for contemporary kitchens. More subtle than black, more sophisticated than stainless steel and more versatile as a contrast with colour accents, metallic finishes and appliances or beautiful timber kitchens. It is excellent to see more choice appearing for customers from two popular brands at different points of the market, both offering stunning-looking range cookers which combine clean contemporary looks with warmth and character. Slate is an ideal foil for this, and we expect to see both of these new Slate Grey range cookers doing very well.